Are you considering becoming a licensed massage therapist (LMT) but are curious to know what’s involved when it comes to making this career choice? Choosing to become a masseuse has many rewards and benefits, such as creating your hours, working with people to make them feel better, and having a variety of workplace options. The cool thing about attending massage therapy school is once you have that certification and pass the licensing exam, you’re ready to go out there and fulfill your dream. 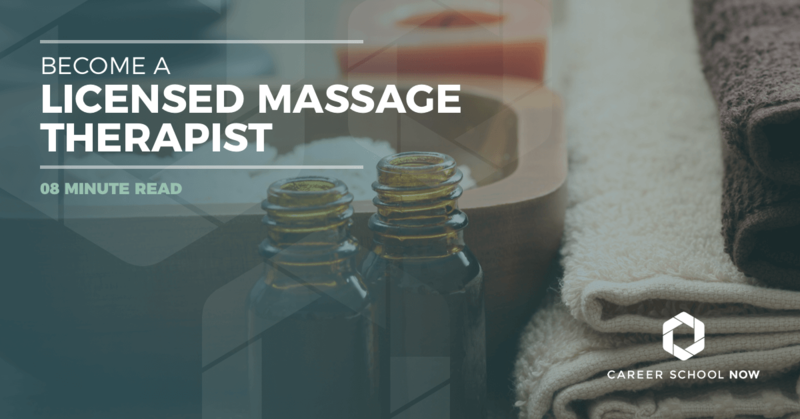 Read on to understand what to expect when becoming a massage therapist. To be eligible to attend massage therapy school, you must be a minimum of 16 years of age and either be a high school graduate or have a GED. But, from there, you should possess certain traits to be successful in the competitive field of massage therapy. Because massage therapists work on bodies, muscles, and tissues, training on human anatomy and physiology will be part of a massage therapy course. Massage therapy students will take courses in kinesiology, which is the study of motion and mechanics of the human body; pathology, history of massage, benefits and effects of massage, laws and regulations of massage therapy, different modalities or types of massage such as Swedish, hot stone, sports, deep tissue, prenatal, and more. There is also the hands-on aspect of massage therapy school which is the training portion of a class. The instructor will demonstrate the lesson and then the class will typically break down into groups where they will work on each other. A typical school day in massage therapy school will include two one-hour technical classes and 2.5 hours of hands-on training. The numbers may change depending on where the massage therapy courses are taken. Not only will the class instructor guide their students through both the practical and hands-on segments, but they will also prepare them for the licensing exam which is the last factor before going out and working as a massage therapist. If you choose to take the practical courses through an online school, you still will need to find a way to incorporate the lab portion of hands-on experience and must be able to prove it in order to take the required state licensing exam. Because massage therapists have to be licensed in most of the states, it is necessary to be trained through a massage therapy school. Each state has it’s own set of requirements, but they all have set hours along with passing the exam called the MBLEx. Be sure to check with your own state to find out exactly what is necessary. The fair minimum number of hours a massage therapist needs to train for depends on their state, but it’s between 330-1,000 hours with an average of 600 hours. It depends on the structure of your training program whether this can be done in a matter of weeks or longer. Some programs can take two years. Whether you decided to go full or part-time will also be what determines the length of schooling. In some cases, upon graduation, the massage therapist will need to practice under a seasoned massage therapist. This part of the training lasts up to six months. With massage therapy school averaging between 500-600 hours, the bottom line cost of the education is approximate $6,000-$10,000 before the necessary school supplies are purchased. If you go to a community college, the cost of the course runs on par with the school’s tuition per credit hour, but private massage therapy schools will have different prices. Massage therapy school prices can range anywhere between $6-$17 per hour of class time with an average of $9-$10/hour of education. The shorter the massage therapy program is, the less it will cost. Some programs do include the cost of the chair or table which runs around $500. Factors that determine the cost of massage therapy school are location, curriculum courses, hours of instruction, facilities, and cost of supplies. When looking for a massage therapy school, be sure to find out from the admissions office whether textbooks, oils and lotions, and massage tables or chairs are included in the cost of the school. Be sure to find out if there are scholarships and loans available, if cost is a factor. In massage therapy school, students are taught a variety of modalities and techniques. Students practice these on each other, which is the lab portion of massage school. Students will learn how to combine different techniques to best service their future clients’ needs. Students are encouraged to discover their creativity within their approach to the various techniques and apply them when working with their classmates to find what works and what doesn’t. Swedish Massage: This technique uses long, flowing strokes to create a relaxing, de-stressing massage. Deep-Tissue Massage: The deep-tissue massage is used to release muscle tension by using more pressure. Trigger-Point Massage: This technique focuses on specific areas and muscles that are holding tension. It releases the knots, as well. Sports Massage: Sports massage is specific to athletes who overuse their muscles. Many sports teams have their own, personal sports massage therapist on call. Reflexology: Originated in Asian cultures, reflexology focuses on the foot to release tension from the rest of the body. Chair Massage: This is a popular form of massage where the client, who is fully clothed, sits in a special massage chair to receive their massage. Massage Career Now has an article about other popular massage modalities. Most states require students to sit for the National Certification Examination for Therapeutic Massage (NCETM) or the National Certification Examination for Therapeutic Massage and Bodywork (NCETMB) held by the NCBTMB. However, some states may require the students to take the Massage and Bodywork Licensing Exam (MBLEx) which is maintained by the Federation of State Massage Therapy Board. The exams must be retaken every four years in order to keep the license current. But, an alternative to retaking the exam, 48 hours of continuing education with 200 hours of massage therapy completed within the four year period is acceptable. There must be documented proof in order for this to be a valid option. There are only six states that have no licensing requirements. They are Alaska, Kansas, Minnesota, Oklahoma, Vermont, and Wyoming. To work as a massage therapist in any of the other states, you must be certified and licensed and each state has their own set of requirements. Masseuses can be found working in a variety of spaces. Their work conditions vary depending on the work environment and need of the client. Medical and Healthcare: Massage therapists who work in the medical and healthcare industry focus on healing their clients. While they may be in a more relaxed atmosphere, the practice doesn’t concentrate on the relaxation of massage. Spas and Salons: Spas and Salons can be found everywhere, from a strip mall to a cruise ship. It is a more relaxed environment filled with lovely smelling candles and dim lighting. Massage in the spa and salon setting is regular part massage and experience. Self-Employed: Many massage therapists choose to freelance which allows them the freedom to choose their clients, work hours, and workspace. They may work out of their own homes or travel to their clients homes, bringing their supplies along with them. Sports and Fitness: Similar to working in the healthcare industry, Sports and Fitness massage therapists focus on the healing aspect of the profession, not the relaxation. So, they may work in injury rehabilitation clinics, chiropractic practices, and health clubs. Massage has been around throughout history because of it’s much-needed healing and restorative properties. Going to see a massage therapist is one type of appointment that, instead of dreading, most people look very forward to! How could you not love a career like that? The employment for massage therapists will see a huge growth spurt between now and 2026. Employment is projected to grow 24 percent which is significantly faster than most other occupations. Because licensing regulations are being mandated by most states, massage therapy will become an even more respected and accepted alternative to pain management and overall health and wellness. As this trend continues, more healthcare providers will likely prescribe massage therapy as part of a treatment plan, but it may be made difficult due to insurance coverage's being limited. There has been a drastic increase in the number of massage clinics opening around the country, leading to more employment for massage therapists. And, the number of sports teams employing massage therapists has risen, as well. These are just two factors that are driving the employment growth in a positive direction. The Bureau of Labor Statistics states that massage therapists are making a median annual salary of $39,860. Those in the top 10% made closer to $75,000 while the bottom 10% made a bit under $20,000 annually. Most massage therapists make a combination of salary plus tips. The cities where massage therapists make the highest salaries are Anchorage, Alaska, Pittsfield, Massachusetts, and Danbury, Connecticut.